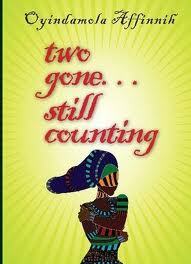 Book Review: Oyindamola Affinnih's "Two Gone ... Still Counting"
There's a Yoruba myth which states that a baby who falls off her mothers back, while being carried, "would face the death of all men she marries until the eighth one". The only way out of the curse is for the mother to "run round a large market seven times, naked". So Amani Bashorun finds out from her parents when she is fifteen. To break the curse, her mother convinces her father to let the family visit Nigeria for a few weeks. Once in Nigeria, a tragic incident happens, and Amani has to fight to survive in this new, and cruel, environment she finds herself in. Two Gone ... Still Counting, is Oyindamola Affinnih's debut novel and while superstition, and its hold on an individual, forms the backdrop to this tale, it is really about the plight of a young girl in a contemporary Nigerian society. Amani moved from a relatively affluent background in England, to a place where she was forced to grow up much too quickly. Her story also introduced certain aspects still prevalent in Nigeria - family fighting over property (particularly after the loss of an affluent family member) and the torturing of children accused of witchcraft. This was an interesting debut, exploring a range of issues that could be overlooked in a more modern setting. By the end of the novel, it did make me wonder if things that happened to Amani (especially later on in her life) were due to superstition, or just merely a coincidence.